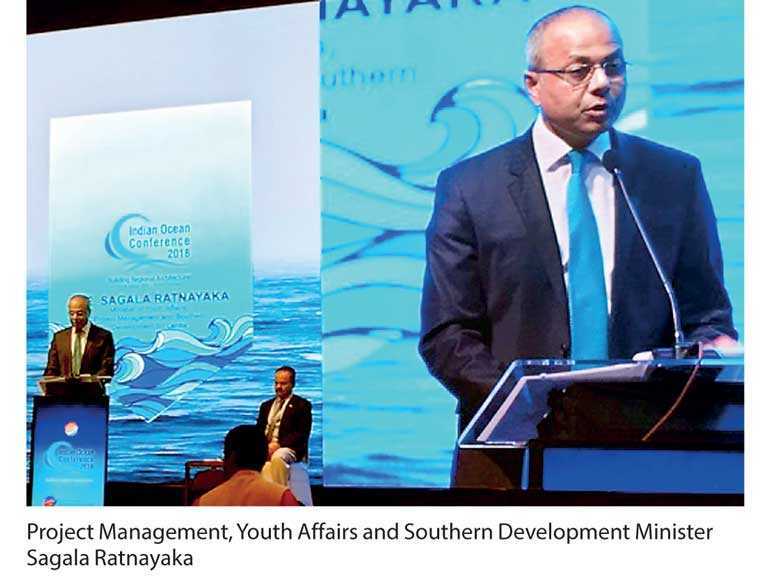 Project Management, Youth Affairs and Southern Development Minister Sagala Ratnayaka, addressing the 3rd Indian Ocean Conference in Vietnam on 28 August, called for ‘Oceanic Good Governance’ in the region and said Sri Lanka was engaging in initiatives with regional players who have major economic stakes in the Indian Ocean. “Sri Lanka is also pushing to further integrate with the world by undertaking reforms to facilitate trade and encourage productive foreign investments,” the Minister said in his speech. “Sri Lanka has a clear vision of what the country wants to be in the world today. It is repositioning itself to optimise its relationship with its neighbours and other partners, to leverage its geostrategic position and make it a hub of the India Ocean,” he also added. Explaining Sri Lanka’s position on the matter, the Minister said, “Sri Lanka’s strategy is to leverage investments to boost its industries such as tourism, expand its manufacturing base, and safeguard its main exports: such as garments and tea. Accordingly, the Indian Ocean region plays a critical role in driving the global economy, and it will play an even more important role in the future. “The Indian Ocean is central to deciding our common global future. The shared nature of the Indian Ocean needs to be recognised and it is in our common interest to care, protect and develop this shared space for mutual benefit. Maintaining peace and security in the Indian Ocean is a prerequisite for the development and growth of the region. It is the collective responsibility of the countries in this region and beyond to ensure that the Indian Ocean is better managed, safe, productive and resilient – through ‘Oceanic Good Governance’. “The issues around the Indian Ocean are complex and require concerted effort by littoral states to address the issues and take advantage of the opportunities that the ocean presents. At present there are multiple Indian Ocean organisations and forums, however in terms of achieving effective regional cooperation there is still a long way to go. Therefore, what is the most suitable regional architecture that will focus on key issues but also provide the necessary perspective of sub-regional dynamics that drives a coherent overall policy on ocean governance? “We may need to consider a multi-layered approach both in terms of division of thematic responsibilities and in terms of sub-regional interests, within an overarching Indian Ocean framework of shared values and principles. There is no perfect fit, on what regional architecture works best for such a vast ocean space. There are issues that can be addressed as a wider Indian Ocean community, and there are issues that can be dealt with more meaningfully at a thematic level or sub-regional level. It is about taking forward all these strands of activity within an architecture based on shared values and principles founded upon the UN Convention on the Law of the Sea. “In my view, it is high time for us, the littoral states, to be the masters of our own fate and the captains of our own ship. There should be increased coordination, participation and engagement by littoral states in determining how affairs are run in the Indian Ocean.